Vintage Shelly Fine Bone China White Ware, Dainty Tea Cup Pattern, Tea Set, 39 Pieces, Made in the 1940's and 1950's. Beautiful White Ware Tea Set, having a Service for (12) Twelve (missing one cup), by Shelly Fine Bone China Company, in their "Dainty" Tea Cup Pattern. Pieces are scalloped, Fluted and somewhat Embossed, with Cups and Creamer having 22kt Gold Handles. 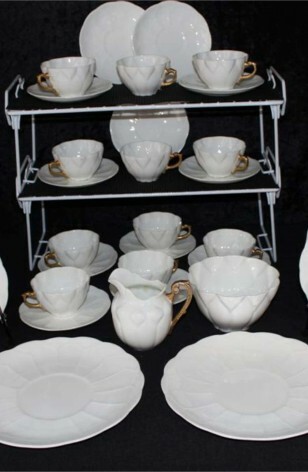 White Ware was made during WWII and the 1950's by Edict of the Board of Trade. Set could be used with any color, and would be very attractive.